Ten years after its publication, "Beginning Mindfulness" continues to be one of the most successful courses of study and practice in Buddhist mindfulness meditation, and one of the most commonly used. It is now available in both paperback and ebook editions. "Andrew Weiss' new book on mindfulness meditation is a gem. It is clear and comprehensive, a supurb contribution to the subject." -- Larry Rosenburg, author of "Breath by Breath"
"Clear, accessible, helpful, good teaching to start one on the path of mindfulness" -- Jack Kornfield, author of "A Path with Heart"
Purchase "Beginning Mindfulness" from amazon.com, Barnes & Noble, your local independent bookstore or New World Library. Mindfulness is our complete, spacious, attentive awareness of everything in the present moment. To live in mindfulness means not to be pulled away by memories of the past or anticipation of the future. Mindful living engages us completely in this moment. We learn to be present to our fears, anxieties, worries or sorrows without being overwhelmed by them. It allows us to live free of judgement, and to make everything in our daily lives sacred and full of meaning, even things as simple as washing the dishes or turning on an electric light. To live in mindfulness is an art. It requires our attentiveness and skill, and repays us many times over with lightness, calm, honesty and joy. Because it encourages us to live in the present moment, mindful living allows us to heal our relationships, live more consciously, and move through the world gracefully. Learning mindful living -- "living awareness" -- is a ongoing, lifelong spiritual practice. It is the essence of Buddhist meditation, and it becomes the core of our daily lives. Why is "Beginning Mindfulness" Unique? "Beginning Mindfulness" is a structured course of mindfulness study. It is composed of ten sequential sections. Each section presents a practice which develops out of the preceeding one. Each section focuses on both the formal practices of sitting and walking meditation and on the "informal" practice of daily life mindfulness. 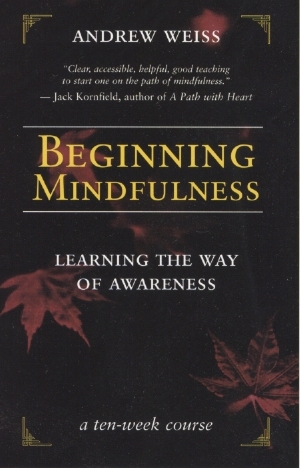 "Beginning Mindfulness" instructs us in how to establish a mindfulness practice in the reality of daily life. Author Andrew Weiss also brings to the book his experience in the practice traditions of Japanese and Korean Zen and in the practice community of the Vietnamese monk Thich Nhat Hanh. "The forcefulness of Zen in cutting through confused thinking is balanced by the gentle awareness practices of Thich Nhat Hanh in Andrew's presentation of mindfulness," says Mu Soeng, the director of the Barre Center for Buddhist Studies. Richard Brady, a mathematics teacher who teaches mindfulness practice to private school teachers and others, has used "Beginning Mindfulness" for years as his core text. Richard says, "Andrew Weiss' book has been a tremendous resource for my students. Its lesseons were easily read and put into practice by newcomers to mindfulness. Experienced practitioners found in them new approaches that expanded their range of practice and insights that deepened their experience of familiar practices."